There really isn’t anything quite like the Maori slot machine game on the net at this moment in time. Experience this unique game focused on one of the less known Maori culture. Endorphina have outdone themselves with their brand-new Maori slot machine. We have tribal themed slots before, but most of them tend to centre on Aztecs, Inca, Maya, Native Americans, or Hawaii. Having a slot based on the Maori peoples of New Zealand is totally unique. One can only hope that the rest of the game lives up to its impressive theme. 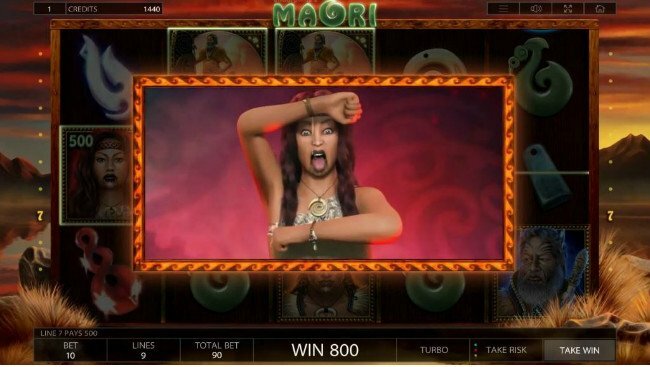 Find out if it does in our Maori slot review. The Maori slot has been wonderfully designed. You can expect to find the people themselves as well as plenty of tribal imagery forming the Maori slot graphics. However, you will also note that there is a touch of the fantastical and mythical even about the imagery which appears in the Maori game. 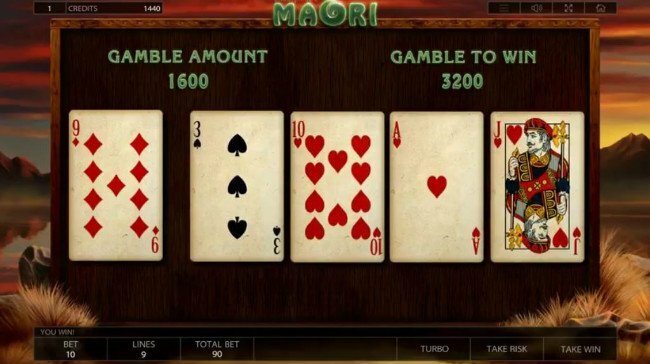 The best way to describe it is to say that the Maori video slot is authentic and yet fantasy-like at the same time. Petite is another word you could use to describe this slot, although only so far as to refer to its payline structure. There are just 9 lines spread on this slot’s 5 reels, and they are adjustable if you want them to be. Players can select coin values which range from 0.01 up to 1.00, and bet as many as 10 coins per line. This gives the Maori slot a floor bet of just 0.01 per line per spin, and a ceiling bet of 90.00 per spin. Wilds appear as group symbols. These tribe icons can double the value of all winning combinations in which they appear. They also appear as the best-paying symbols in the Maori online slot, if you land 5 of them on any active payline. Scatter symbols appear as golden emblems, and landing 3 or more anywhere on the reels at the same time will trigger a free spins bonus. This free spins bonus is unique as it initially offers unlimited free games. 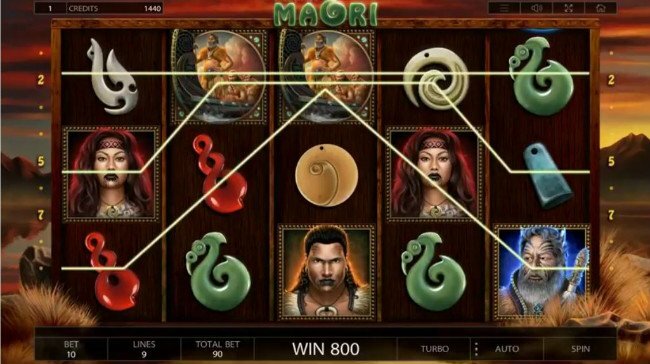 The best of all the Maori slot bonuses is the free spins feature. It is majestic and confusing at the same time. You can start with unlimited free spins, and when at least one blue sun appears on the counter, the bonus ends. Green suns at one blue sun to the counter, and offer 2x your total bet. Red suns can destroy the blue suns and offer 2x the total bet. At some point in the game, the number of blue suns will be overwhelming and end the bonus round. There is no saying of just how many blue suns your free spins bonus will let you get away with before the bonus ends; it appears to be random. There really isn’t anything quite like the Maori slot machine game on the net at this moment in time. Endorphina should be congratulated for being incredibly original and tasteful in the way that they have designed this slot. We heartily recommend everybody to give this slot a spin at least once, even if the bonus round is initially confusing.